This entryway—also used as a mudroom of sorts—is part of an addition that extends the entire length of the back of the home. The door to the right (just visible) is crafted to look exactly like the original entry door. Arches are a theme throughout the home. 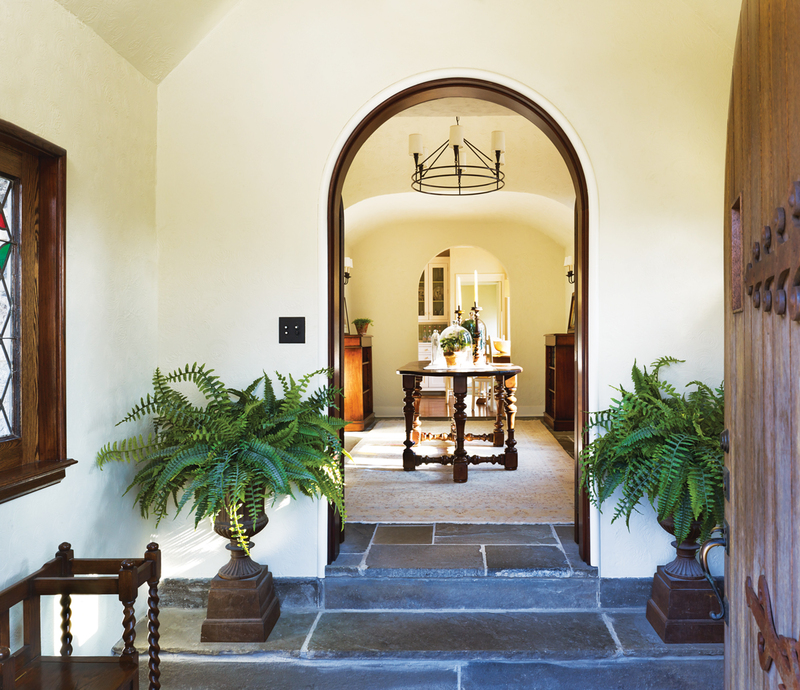 The first arch here has half-round trim, which is used also in the home’s other arches. The far arch, which leads to the kitchen, had been a square door. This new foyer space, just off the new entryway, is also part of the addition. The three-paneled stained-glass window is new but fits the style and spirit of the cottage-like home. Owner Mark Polinski didn’t want a formal dining room, so this late-18th-century English library table can be used for dining. 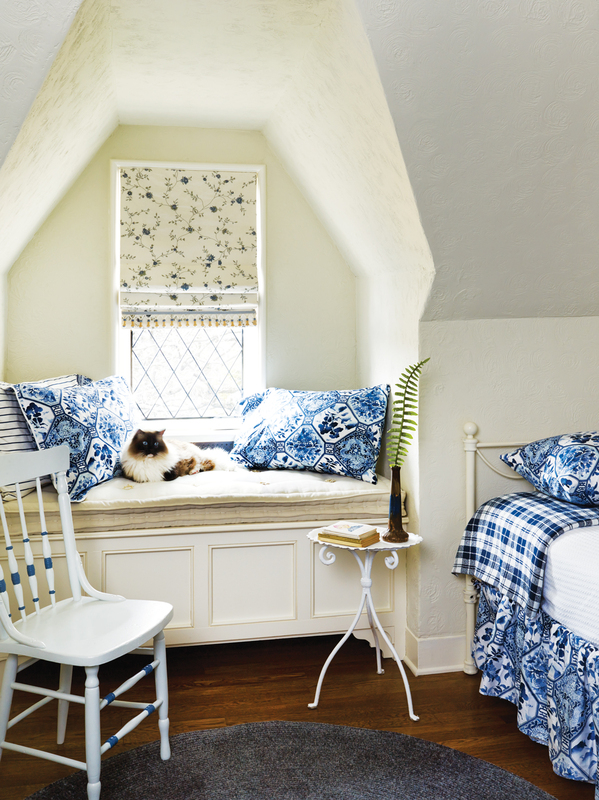 A window seat provides additional seating. 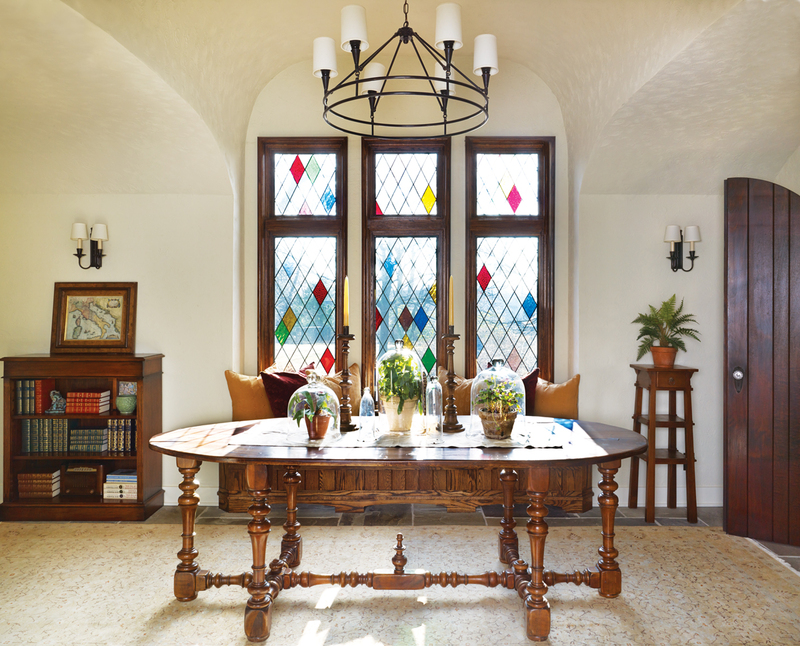 A wrought iron chandelier crowns the table and is complemented by two wrought iron sconces flanking the window. The arch at left in the living room had been a solid wall. The wall came down to open up the space to the new foyer addition. The ceiling beams are original but not structural. English reproduction chairs flank a beige chenille sofa. The wrought iron coffee table strikes an eclectic note. 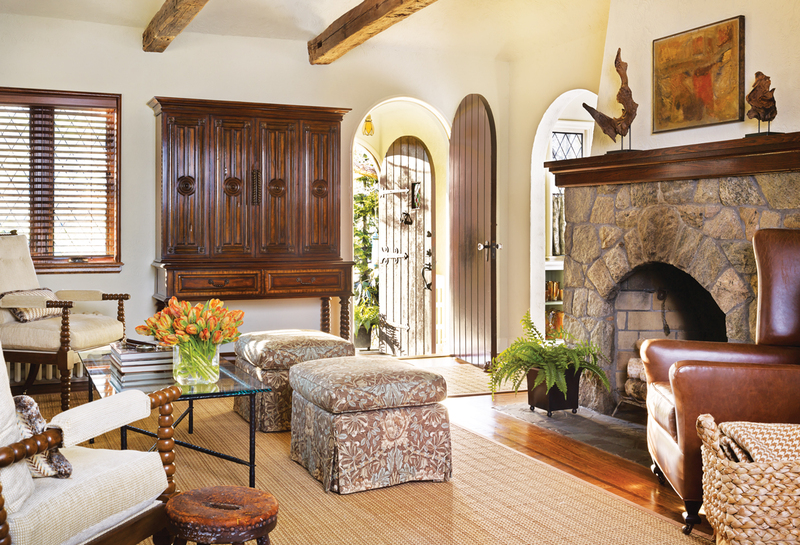 The arched door in the living room is the original entry and had been the only one. The stone fireplace, also original, had probably been used to heat the entire house at one time, designer Jeffrey French says. Fronting the coffee table are two ottomans in a William Morris-style pattern in soft greens and blues. The large cabinet-like piece—a 19th-century English reproduction—hides a television. The new kitchen evokes one appropriate to the original early-1900s cottage. 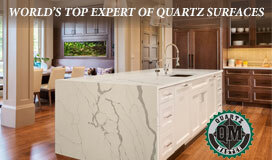 “We wanted the kitchen to look like individual furnishings were added over the years. For example, the refrigerator and the pantry [neither shown] are different from the bead-board cabinets on both sides of the range.” The bead-board island, with shelving for books and a built-in wine rack, is topped by a deep blue/charcoal soapstone countertop. The ceiling is bead board also. Avocado green subway tile is used behind the range. The designer and architect removed a wall in the kitchen to open up the staircase (at left), which leads to the second floor. 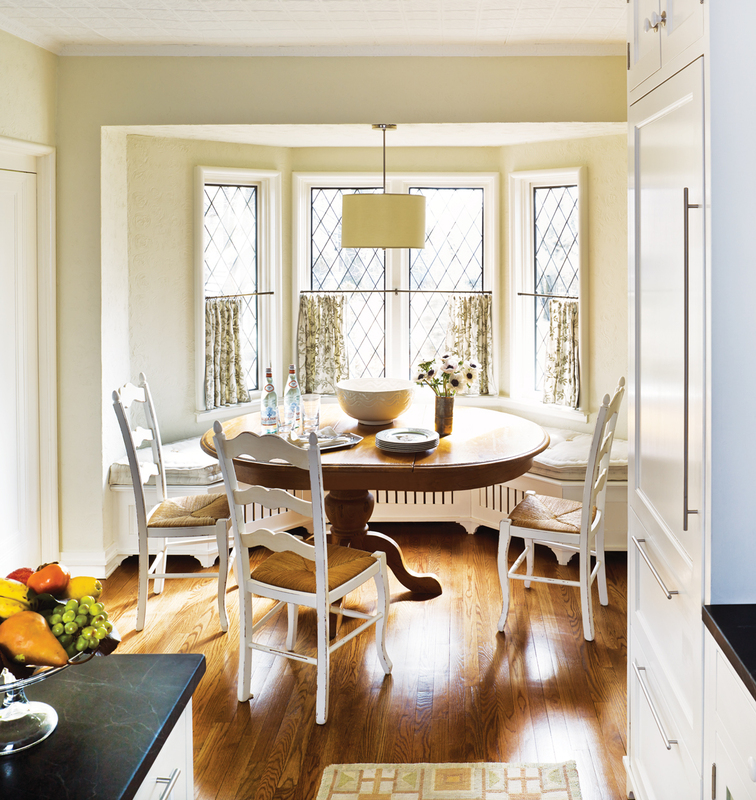 Just off the kitchen, the breakfast room has additional leaded-glass windows and another window seat—this one curved—that sits atop a radiator cover. Ladder back chairs with cane seats flank a simple pedestal table. 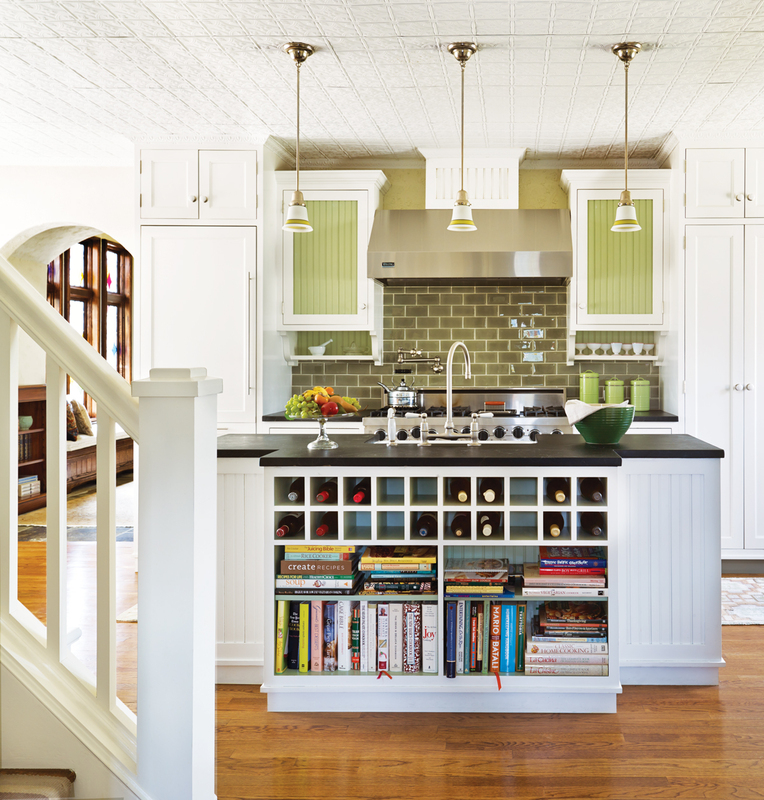 To the right of the island are four leaded-glass windows and built-in shelving flanking a window seat atop a new—designed to look old—radiator cover. The designer had the home’s original radiators, which provide steam heat, restored for authenticity. The shelves house a collection of colored vintage glass. 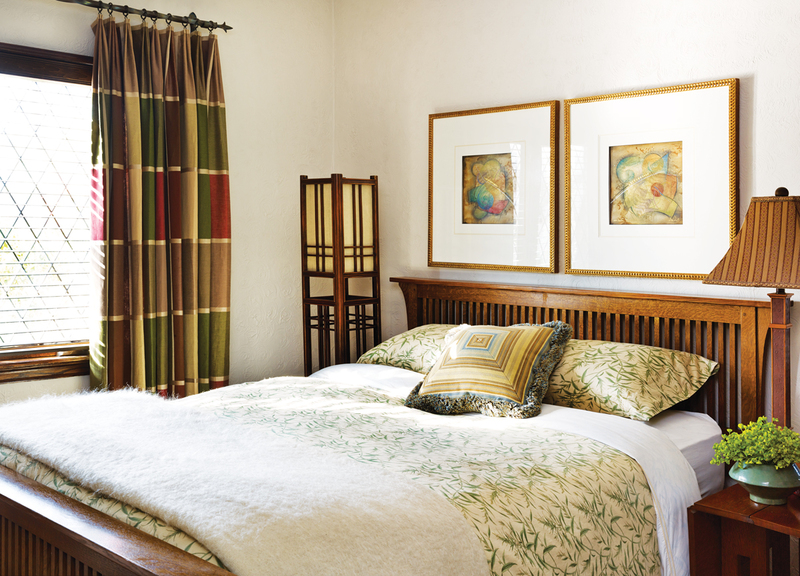 The master bedroom has a Mission-style headboard and nightstand and a reproduction Arts and Crafts-style lantern. Ragdoll cat Buster relaxes in a comfy window seat in an upstairs guest bedroom. 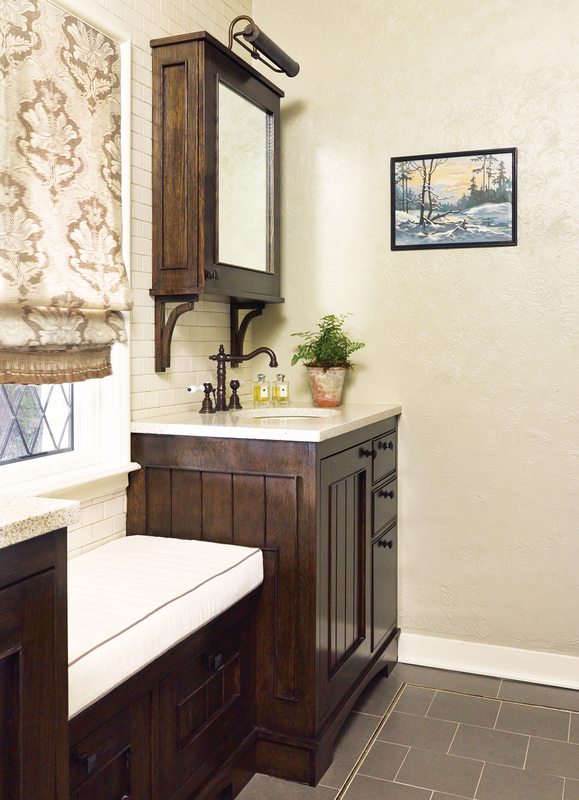 The custom cabinetry includes two vanities (one is shown) on each side of a window seat topped by a window dressed in a taupe, gray and beige panel reminiscent of a William Morris fabric. French designed a medicine cabinet topped by a reading light for an apothecary look. The arch theme found elsewhere in the home shows up here above the shower and soaking tub, which has a vaulted ceiling. It’s clad in white subway tile. The shower curtain matches the window panel. The fixtures are dark bronze while the floor is ceramic tile with a bronze inlay strip. 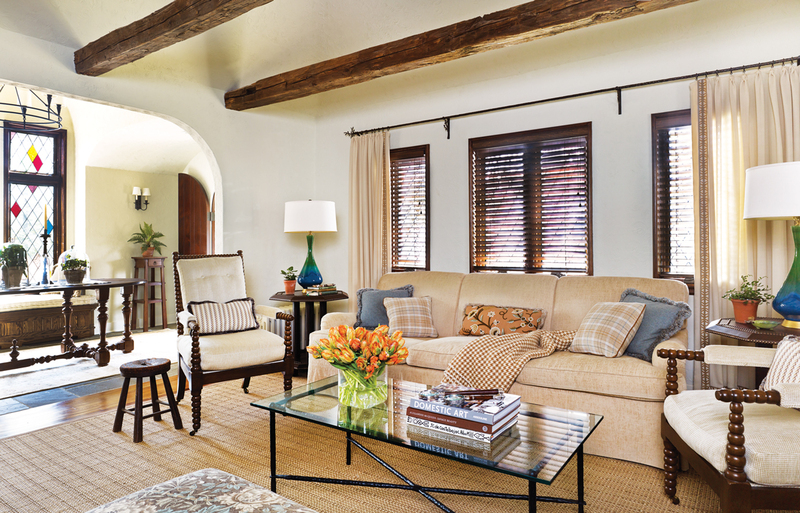 A designer helps a former apartment dweller transform a cotswold cottage-like stone home. Mark Polinski grew up in a small town in Pennsylvania and moved east because he wanted to live in the “big city.” In this case, that turned out to be Jersey City, New Jersey. But when it came time for Polinski to buy a home, he says he “couldn’t wrap my head around the idea of buying a condo, a piece of a building; I wanted a yard and space.” That led to an arduous house hunt that took Polinski first to the Essex County, New Jersey town of Maplewood and its gracious 1930s to 1940s homes. Polinski found one such home but lost it in a bidding war. “I compared every other house I saw to that one; I must have looked at 75 houses and then gave up.” That is until a colleague suggested he resume his search in Bergen County, NJ which, the colleague said, has areas and homes similar to those in Maplewood. That proved to be the best of advice. Polinski eventually found a unique house he fell in love with “instantaneously”: a Cotswold Cottage-like stone home located on a corner of the former Apple Ridge Country Club in Ramsey, NJ. The house is one of four early-20th-century homes built from stone unearthed when the property was being cleared for the orchard it was to become in the early 1900s. The house was move-in ready, Polinski says. But in a total renovation that he describes as “a want, not a need,” he decided to take the cottage back to its roots. The renovation turned out to be a labor of love. Job One was to gut the house. A new furnace and HVAC system—hidden behind walls—was added, windows were replaced and all of the walls were restuccoed. In a small bedroom thought to be original to the house, French found what looked like an original wall that bore a plaster swirl pattern. He used that pattern in the other rooms on walls that had been painted or wallpapered. French also “pulled back years and years of added moldings.” He retained the original half-round trim on the front door and applied the same type of molding to all the door casings. The original front door also featured a curved arch that became a theme throughout the house. 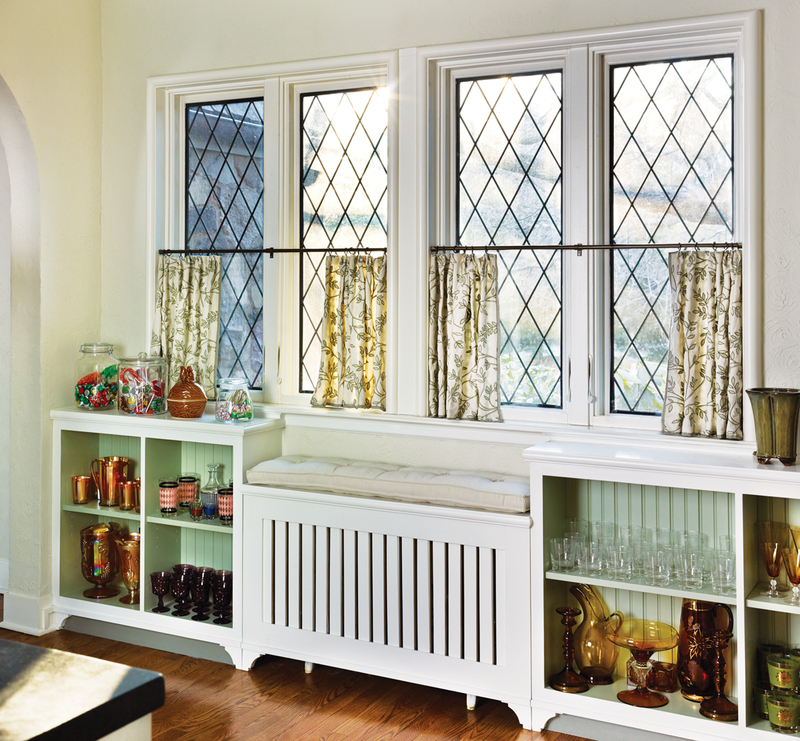 Original leaded-glass windows were single-pane windows. French worked with a glass company to devise a three-pane window with a leaded pane in the middle flanked by modern glass on both sides. Small details included installing push-button electrical switches for authenticity. A former resident had turned a small bathroom into a tiny bedroom for his handicapped mother. 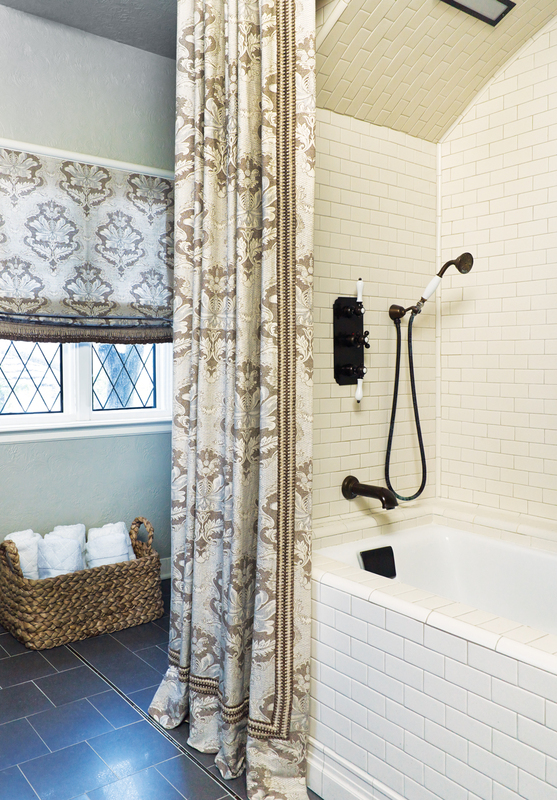 French transformed the space back into a bathroom; this time a master bathroom. The biggest structural change, however, was the construction of an addition to the entire back of the house on what had been a closed porch. The new space became a foyer and new entrance to the home. The new door/entrance into the home is an arched bead-board door made to look exactly like the original front door, which is used now as an alternate entry and which leads into the living room. The addition is all stone. “You can’t tell where the old stone ends and the new stone begins,” French says. The foyer addition—which includes a table that can be used for dining because Polinski didn’t want a formal dining room—not only added space but also created a better flow from the new foyer to the kitchen and living room. French points out it costs as much, if not more, to restore and renovate an old home than to build a new one. Yet Polinski opted to invest in a beautiful old house than to go for new construction. In that new old home, Polinski says, “we kept it a little humble. No crown molding, for instance; that’s not the kind of house it was. We weren’t trying to make it into something it wasn’t. Overall: designer, Jeffrey Mark Interiors in Hoboken; architect, Callori Architects in Leonia; paint, Donald Kaufman Color in New York City; windows, Kolbe Windows & Doors through Dykes Lumber in Weehawken. Foyer: table, ABC Carpet & Home in New York City; chandelier and sconces, O’Lampia Lighting in New York City; runner, Safavieh Rugs in New York City. Living Room: large cabinetry (hiding the television), Horchow; sofa and ottomans, custom by T.L. Chan Upholstery in New York City; chairs, Paul Ferrante Furniture through John Roselli & Associates in New York City; coffee table, Morgik Metal Design in New York City. Kitchen: custom cabinetry, designed by JMI Inc. in Brandon, Mississippi, and produced by Eppley Building and Design in Hawthorne; countertops, Garden State Soapstone in North Brunswick; backsplash, Ann Sacks in New York City; pendants over island, Rejuvenation; appliances: Viking range, Sub-Zero refrigerator. Breakfast Room: table and chairs, ABC Carpet & Home; Master Bedroom: headboard, nightstands and corner light fixture, Stickley Audi & Co. in New York City. Guest Bedroom: small chair and table, homeowner. Master Bathroom: vanities, designed by JMI Inc. and produced by Eppley Building and Design; shower tile, Ann Sacks; flooring Hastings Floor Covering in Groveland, Massachusetts.